There are always days when you miss your alarm clock and oversleep. This leads to you having to get ready faster than normal. However, you remember that your clothes are wrinkled and need to be ironed. You also have cases where a standard iron just doesn’t do a good job of getting rid of wrinkles. This issue is very prevalent for those who like to travel a lot. Stuffing your clothes inside of a suitcase tends to cause many wrinkles to form. It is unavoidable. Having a handy garment steamer with you is necessary for frequent travelers. Garment steamers are also very good at removing dirt and dust mites from items such as mattresses and draperies. It is multiple purpose, unlike the standard steam iron. You also can save money by not having to purchase an ironing board. So, let’s talk about a wonderful garment steamer in the Oster 5011. The Oster 5011 provides you with 1600 watts of powerful steam that is produced within 60 seconds. You are easily able to clean and sanitize delicate fabrics or cloth. The steamer sits on a 360-degree rotating hanger and it comes with clips for easily attaching any clothing or fabric that you need to clean or straighten. With a special ceramic face, the Oster 5011 removes wrinkles and bad odors from your fabrics. The nozzle is easy-to-use and it also comes with a bristle brush. The water tank holds up to 1.8 liters and is detachable. It is very simple to change the water and the tank is transparent making it easy to see the water levels of the tank. It features a long hose and swivel casters that makes it extremely portable and mobile. The rod is telescopic so that it can easily be stored. The hanger on the stand is not very sturdy. Oster provides a high-quality garment steamer. If you are working with polyester and nylon, you will benefit greatly from their steamer. Sadly, it does not work well with cotton. The hanger included on the stand occasionally will not feel sturdy either. However, there are many features that Oster brings us with their Garment Steamer that makes these small issues easy to look over. It is very portable. Moving it around your house is easy. By taking it apart, you also have the option to take it with you when you travel. Keep your clothes looking clean with the included bristle brush and sanitizing feature. If you are in a rush, there is no need to worry. The Oster 5011 only takes roughly 60 seconds to produce steam and get your clothes strengthened. With compact capabilities, storing is easy. There are several garment steamers on the market today. However, not many can compare to Oster’s 5011 steamer. Let’s take Black & Decker’s GST2000 model steamer. Black & Decker is a well-known company that makes many high-quality products. 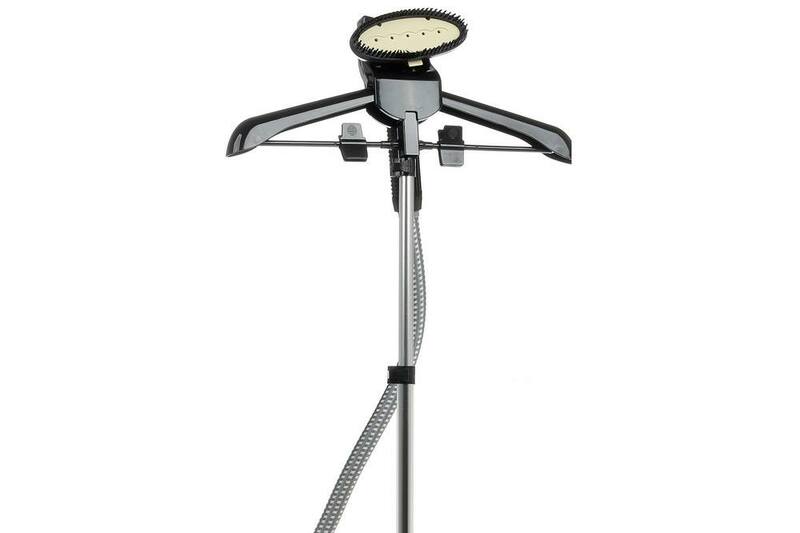 Their GST2000-B5 2000-Watt Garment Steamer provides steam within 40 seconds. It features 3 levels of steam and has overheat protection. Its water tank can hold up to 2.4 liters of water and comes with a colored level indicator so that you can easily see how much water is left in the tank. It also includes a pleat maker and hanger allowing for you to make perfect trouser creases. A lint remover and fabric brush is included to help keep your clothing clean. Oster also offers many of the same features that Black & Decker provides. Black & Decker offers 2000-Watts in their steamer and also provides steam within 40 seconds. In comparison, Oster’s 5011 steamer offers a 1600-watt steamer providing steam within 60 seconds. This difference is not noticeable and the much cheaper price of Oster’s makes it win in this category. Again, Black & Decker’s steamer offers a bigger tank with their 2.4-liter water tank. However, the difference is not noticeable when compared to Oster’s 1.8-liter tank. Both come with quality brushes that are great for removing lint and dirt. Having these multi-purpose features makes the difference between these products and others on the market. Both come on a stand, however, Oster’s stand provides a hanger that makes it easier to clean and steam your clothing. Oster’s stand is also more durable and less flimsy compared to Balck & Decker’s. Being able to use your product is extremely important. If you do not understand how to use your steamer, you will have basically wasted your money. The Black & Decker steamer has an instruction manual that is hard to read. Having a working product is also important. Black & Decker’s garment steamer has several reports that claim the steamer to not work as well. This also goes along with the user manual. If you do not know how to put your steamer together, you will have troubles getting it to work. Oster provides an easy to understand instruction manual and has never had any issues with performing exactly as it was designed to. In the end, Oster’s 5011 1600-Watt garment steamer is the clear victor. It is an easy to use steamer that removes wrinkles and bad odors. You can easily carry it around with you on trips and whenever you need it. It has features that will make it compact and make your life easier. If you wear a lot of cotton, you should probably skip over this steamer though. Otherwise, Oster provides a high-quality and high performing steamer that is worth the price. Compared to other steamers on the market, it easily wins. Others just do not offer the simplicity along with the great features. You cannot go wrong with buying Oster’s 5011 1600-Watt garment steamer.